The latest version of CorsixTH is now out. Beta 8 is really quite close to a playable game. 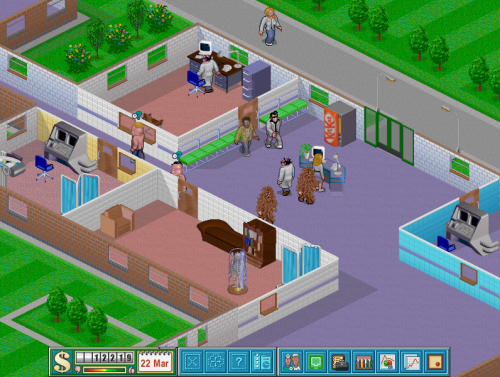 Essentially at the moment it is Theme Hospital with a few features missing and a better screen resolution. See the OpenTH blog for more information. As is probably fairly obvious, I have no time to work on OpenTH at the moment, and nor does Paul. However, we did vaguely think about rewriting it in Scala, just because it would be fun to do a proper project in Scala. At the moment we are all too busy, but it’d be nice to keep it in mind. There is still a place for OpenTH I think. Whilst CorsixTH is really like the original, which seems like a nice thing, it also means that it hasn’t really progressed. The new user interface that was developed for OpenTH is actually really, really nice. Corsix was definitely right though that we made a mistake being true 3D. The idea was that we restricted angles and such enough to make it still appear like the original, despite in fact being 3D. It had many advantages, but just made the code so much more difficult. It also meant we had all the 3D problems of clipping and such as well. It did result in speed boosts though. As may day job has less programming in it now (replaced with research & development) I probably will start to get the will to carry on with a programming project. But as of yet, there is no time. Corsix has released a version of CorsixTH, his Theme Hospital clone, in time for Christmas. It is actually fairly complete. I will also be posting on the OpenTH mailing list later. Also check out Corsix’s blog post about it.